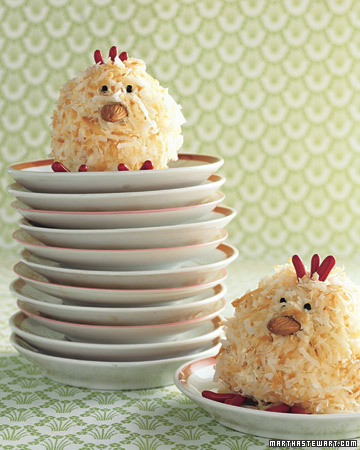 This treat is modeled on one of the symbols of the season -- baby chicks. With their coconut feathers, nutty beaks, and confectionery details, the cakes aren't just eye candy; they're delicious, too. To hatch one of these, you don't have to be an expert baker. Making a batch of chick cupcakes is a perfect task for novices, and kids will love to help. The result will be a whimsical hit at the table. Press toasted shredded coconut into the frosting -- it stands in for fuzzy feathers. Hold the plate at an angle while applying the coconut so the excess falls back into the bowl. Oh I bet those would be easy to make. Thanks for the idea.